This blog is now featured on InterNations! When the expat networking site InterNations contacted me to ask whether I’d like to have my blog included in their Recommended Expat Blogs: Germany section I did a little happy dance and swiftly replied with a resounding YES. I did a little interview with them which you can find here. 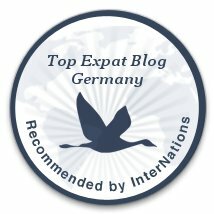 I talk about moving to Germany, the reasons why I did not experience a culture shock, tell the story of starting this blog, and more. Are an expat but haven’t heard of InterNations yet? There is a local InterNations community in most big cities across the globe and they provide great opportunities to make new connections. The Hamburg community is really active with multiple monthly events (read: parties in various places) and there’s a good selection of activity groups with everything from meetups for jazz or cinema lovers to international cooking or walking groups. Hopefully one of these days I can actually take part in such activities. Preferably, with a colorful cocktail in my hand!